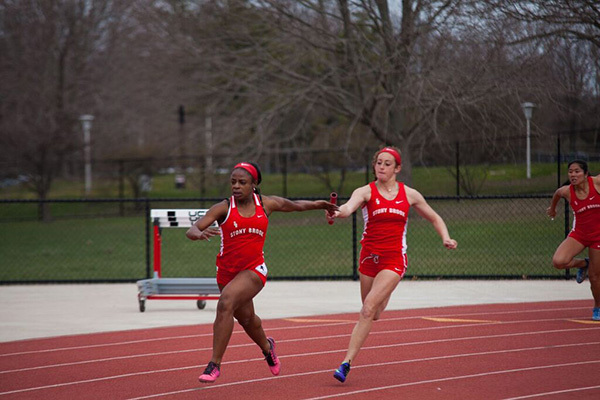 Stony Brook Women’s Track and Field multi runner junior Alyssa Oviasogie immortalized herself in program history by becoming the program’s first Pentathlon Metropolitan Champion earlier this month. Oviasogie repeated the result at the America East Indoor Championships in Boston, Massachusetts on Friday, Feb. 22, overcoming her conference rivals with 3,465 points for the gold medal. The win kicked off a tightly competitive weekend in which the women’s indoor track and field team fell eight points short of third place, finishing with 102 overall. The men’s indoor track and field team also finished in fourth place with 86 overall points. Albany earned the gold medal for both with scores of 178.5 and 213 overall points, respectively. Senior hurdles runner Courtney Warden sparked an impressive team performance by winning the gold medal in the 600 meter hurdles in 8.50 seconds. Warden successfully defended her title for the third consecutive year, earning 10 points for Stony Brook. Senior sprinter Melissa Riback topped the field in the Women’s 500 meter dash by winning in 1:15.18, edging out UMBC junior sprinter Tori Johnson by .03 seconds. While Riback gained the upside in her photo finish, sophomore sprinter Amanda Stead’s late push was enough for second in the Women’s 400 meter dash. The duo tagged along with junior Mary Chimezie and sophomore Janelle Pottinger for a second place finish in the 4X400 meter relay in 3:48.71. One example was junior mid-distance runner Alexandria Ortega earning the silver medal in the Women’s 5000 meter run with a time of 16.55.79, falling to repeat winner Albany junior mid-distance runner Hannah Reinhardt. Although the women’s team fell just short to Binghamton for the bronze medal, Ronan was satisfied by their overall performance. Junior sprinter Ahmed Galal highlighted the Seawolves on Friday by setting a new program record in the 200 meter qualifying round, rocketing through the race in 21.85 seconds. Galal took home the bronze medal in the event and finished behind Albany sophomore Jan Michael Gutierrez Almedina and junior Harmodio Cruz III. The quartet of Galal, seniors Kevon White and Wayne Williams and junior Sean Ideozu blazed through the track in the Men’s 4X400 relay, earning the gold in 3:13.04. The victory was the second consecutive title for the group and set a new program record. Stony Brook will return to Boston for the ECAC/IC4A Championships on Saturday, March 2 and Sunday, March 3.